Hazardous materials require extra safety precautions for both the storage site and active employees. Different materials require different safety measures and storage environments to keep them safe and maintain their efficacy. Our network of storage providers supply certified HazMat warehousing to a variety of toxic and potentially dangerous materials. There are nine classes of hazardous material including flammable substances, explosives, infectious agents, corrosive materials, radioactive matter and others. A wide variety of scientific, industrial and commercial industries utilize compounds in one or more of these categories, making their storage and transport fairly common. We give suppliers and manufacturers dealing in hazardous materials an array of qualified warehouses throughout North America to choose from, all from one accessible location. Each site is equipped with the personnel, insurance, fire suppression systems and containment protocols to safely transport, store, relocate and secure various substances. 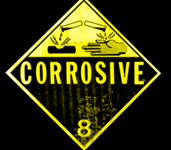 If you are seeking warehouse solutions for hazardous materials, contact us today. We are happy to answer your questions and give you a free rate quote for your materials.